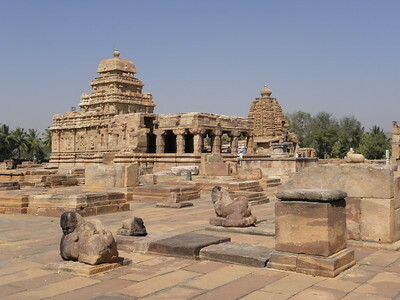 The Group of Monuments at Pattadakal are temples and architectural models that show both Dravidian (South Indian) and Indo-Aryan (North-Indian) styles of architecture, and a unique blend of these two. They were commissioned by the Chalukya Dynasty who ruled part of South India. The constructions mainly date from the 7th and 8th centuries. They include 9 Shiva Temples and 1 Jain Temple. Part of the site is still in use as an active centre of worship, mainly at the sacred bull Nandi that is made of black granite and fully intact. Pattadakal was the ceremonial capital of the Chalukyas, who also ruled from nearby Aihole and Badami. The epogee of their art can be seen in Pattadakal, with the Virupaksha temple as the masterpiece. Pattadakal seems to have functioned as a kind of Art School, where forms of architecture and sculpture were tried out at models before applying them at the main temples. This is one rarely visited WHS. It currently ranks 726 out of 911 sites that have been ticked off by visitors of this website. Its story is not well-known, and its remote location doesn’t help either: Pattadakal lies amidst the flat farmlands of Karnataka, about 150km north of Hampi. To get there, I rented a car and a driver for a day from Hospet. We headed out at 6.30 a.m. At this time of day, you get to watch rural India wake up – people fetching water from pumps, and many others disappearing into the fields with a coloured plastic mug of water in hand for a “toilet” break. After 3.5 hours on a half-bad road (the only alternative is a “horrible road”), we arrived at the town of Patta Dakal. The WHS is signposted from afar, displaying the familiar logo. My first impression of the monumental complex was a pleasant surprise: it is a fenced off area near the river, not too large but cluttered with temples and architectural models. I somehow was expecting a ruined archaeological site. They even succeed in keeping the grass green. The entrance fee, as at all other Indian WHS, is 250rs. For that you get to sign the visitor book – I noticed that there are about 20 foreigners coming here each day, not too bad. I visited on a Sunday, and the site was quite busy with locals. I hired a guide named Raj to show me around – a good choice as he was an enthusiastic guy speaking very understandable English. He was able to pinpoint to details that I would have walked by on my own. In the main temple for example there are writings on the columns displaying the names of financial contributors: a local businessman gave 51 gold coins, another person sponsored 3 columns. The Chalukyan dynasty had run out of money before finishing the construction. The guide also told me that there was a severe flooding here over a year ago – I had missed it in our news updates. The river overflowed, and the local people living near the riverbanks saw their houses been washed away and climbed on top of the temples and other constructions on site. They were rescued 4 days later by helicopters. Many are still living in shelters. The monuments were not harmed, though they suffer quite a bit from erosion because they’re made of soft sandstone. In all, a very worthwhile WHS to get out of your way for. I spent about 2 hours at the site. I did not visited the Jain temple which is also included in the WHS. This lies at the other end of town, and “fell down” according to my guide. I visited this WHS in November 2016. It is a great mix of Dravidian and Rekha-nagara styles but in terms of size it is more comparible to Khajuraho than Hampi. I really enjoyed the main temple complex of Pattadakal consisting of Galganatha, Sangamesvara, Virupaksha and Kashi Vishweshvara temples as well as several remains and minor shrines. Near the main complex lies the beautifully sculpted Papanatha Temple with a raised podium and superb Ramayana sculptures on the Southern wall (best to visit in the afternoon for photography). About 3km away is the Jaina Narayan Temple which has recently been completely dismantled, numbered and painstakingly rebuilt stone by stone. Due to recent floods, the walls have become darker and the humid and dark interior has attracted several bats. All in all Pattadakal is a very interesting WHS but an extension with Aihole and Badami will really boost this site's OUV in my opinion. There is a place in Karnataka which, however iscribed as UNESCO Patrimony of Mankind, is very rarely visited by foreign tourists. These are magnificent temples in Pattadakal, nearby temples in Aihole and ancient caves in Badami (the latter two on TWHS so far). 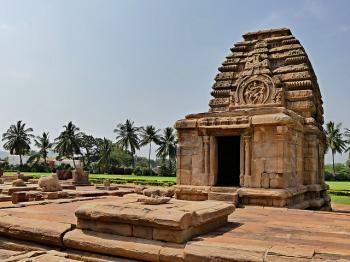 The reason of these rare visits is location – Pattadakal is distant from big cities and railway lines. The most convenient way to reach Pattadakal is taking a taxi from Hampi. Full day trip in March 2015 cost me 3300 rupees (I travelled alone). I started my trip from Aihole, well-known place of cult, but in rather poor condition nowadays. There are many tiny ancient temples among ordinary buildings on very large area, so it seems this place was wery mighty in the past. Then we headed to Pattadakal, the true marvel of inland Karnataka. Unlike Aihole, Pattadakal is very well preserved. The place was built with great architectural taste and it is a real pleasure just to sit on the grass and contemplate the view of the complex. There are several temples here and all of them are worth visiting (although, as usual for Hindu temples, they are more interesting outside than inside). At the end, I liked Pattadakal much more than more famous Hampi. After Pattadakal we drove 20-30 kilometers through real Indian villages – with ox carts, goats transported in tuk-tuks and other nice views. Our last goal was Badami, where in VI-th and VII-th century in caves local people carved magnificent sculptures of (mainly) Siva and Vishnu. The sculptures now are in excellent condition and there are many local tourists here. It requires some effort to visit the caves, as there are lots of steps, but the place i definitely worth it. I hope this place will also be inscribed by UNESCO. Entry ticket to these three places was 250 rupees each plus 125 for photo camera. Visiting Pattadkal is like viewing smallscale models of the various temple architechture styles in India, all at one place. The place is very serene and clean. A rewarding exprerience.